Josep Gombau’s brilliant, expressive head would have been sporting a wide Colgate smile yesterday when he was announced as the voters’ choice to coach the A-League All-Stars. The eccentric Spaniard’s first season in charge of Adelaide United has been nothing if not eventful, and the privilege of managing some of the competition’s best players against Juventus in front of 80,000 fans will end it with a fitting flourish. It’ll also put him in the thick of what will likely be a footballing moment in time – Alessandro Del Piero’s final match, representing the league that has become his adopted home against his beloved Bianconeri. Gombau told media yesterday he will not build his side around Del Piero, but you’d expect event organisers will twist his arm and make him do it anyway should the Italian legend decide to hang up the boots. Whatever he does with the All-Stars – and let’s hope all the stars are there, unlike last time – it’ll be worth watching. There have been skeptics of his promises and methods – plenty, in fact. You’re reading the words of one of them. Send the humble pie this way, please. I’ll be glad to eat it. Debate will rage over whether Gombau truly deserves the opportunity – after all, his Reds side has not won anything just yet, while Brisbane Roar boss Mike Mulvey is eyeing off the double. But complaining about the outcome of a popularity contest for what will be a meaningless but (hopefully) entertaining exhibition match is about as useful as complaining about Qatar winning hosting rights for the 2022 FIFA World Cup. You may have a point, but nobody who matters cares what you think, nothing’s going to change, and you’re better off focusing your energy on something else. Besides, Gombau’s journey thus far is worthy of appreciation. He is perhaps the A-League’s best coaching cult figure since tan-blazered Czech weirdo Franz Straka. Like Straka, Gombau’s personal fan-base extends far beyond the borders of South Australia. He is admired not only for his dogged commitment to playing his brand of football, but also for wearing his heart on his sleeve. That, and his lava lamp face. And his fascinating cadence. And the fact that his signature looks like a clock stuck at 11:40am. Seriously, look at it. What’s not to love? The key moment in his reign, of course, was his infamous verbal scuffle with News Corp’s Val Migliaccio late last year. At the time, Adelaide had won just once in nine outings. Gombau was being hounded – rightly, in my opinion – for effectively writing off his side’s title chances and choosing to treat the season as an educational gauntlet. Gombau’s outburst was unprofessional and uncalled for, but in the court of public opinion, he won. He is the good guy. That’s how it goes. Instead of further legitimising the pressure that was building over his future at the club, the incident cemented his position. It pulled together a struggling United playing group, one that was still coming to terms with Gombau’s new game plan and showcasing teething issues on a weekly basis. “It just brought a sense of reality and urgency that we didn’t quite have,” striker Bruce Djite told SBS on Friday night. In other words, it made the players pull their fingers out, for fear the revolving door was about to get another push. It also brought onside the fans who, in a battle between their club’s coach and a writer from the local rag, would side with the gaffer every day of the week. 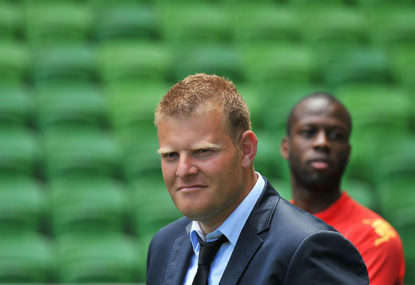 Gombau has since proven himself to be an astute tactician with unwavering self-belief. When they get going, United play some of the best football in the competition. It’s fast, it’s captivating, it’s aesthetically pleasing. Most importantly, it’s effective. Imagine how good they’ll be with another pre-season under their belts. Credit also has to be paid to the Adelaide United administration. Heard from Greg Griffin recently? Exactly. The chairman and his cohorts have taken a backward step. Instead of sticking their nose into something they don’t understand, they’re allowing the football people to talk about the football. For a time it seemed Griffin was putting out public spotfires every second day. No doubt his move out of the limelight has only reinforced Gombau’s authority. The Reds can take a huge step towards securing second spot on the ladder and giving themselves an opportunity to host the A-League grand final at the new Adelaide Oval with a win over Newcastle on Friday night. After the first AFL Showdown held there turned into something closer to a celebration of civic pride, it would cap off an unbelievable baptism for a ground treasured by South Australian sports fans. With Josep Gombau at the helm, and his players and the fans all singing from the same hymn book, anything is possible.